Our range of Compressed Asbestos Gaskets is widely demanded in the market because of its outstanding quality. These Compressed Asbestos Gaskets are manufactured using carefully selected chrysotile fibers, closely blended with suitable heat resisting binders and fillers and vulcanized into sheets of homogenous compositions and uniform thickness. We offer Fiber Gaskets to our clients. Following are the features of Fiber Gasket. Price Start from Rs 20 . VEGETABLE FIBRESTRONG BUT COMPRESSIBLEFibreflex gasket paper is plant fibre, chemically treated to resist coal tar, oils, water, alcohol, grease, air, gas, gasoline and solvents of all kinds. Resists heavy pressure--Strong but Compressible. A perfect combination inter braid packing having Expanded PTFE Graphite fibers at the faces and special Aramid fiber at the corners. We are a well-known name, involved in providing an extensive series of Non Asbestos Compressed Fiber Gasket. Our product is extremely employed by customers owing to their sturdy nature. 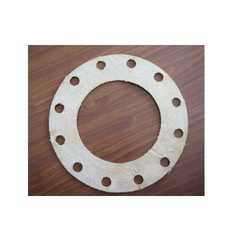 We are engaged in offering wide range of Fiber Gaskets. 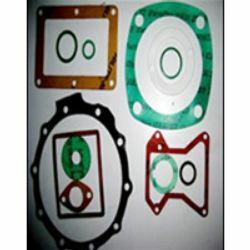 These Gaskets are made from high quality gasket material which ensures high durability at its user end. It is a high pressure gasket based on Kevlar and Aramid Fibers. It is a perfect gasket materials for tube and pipe flanges, vessels, containers, boilers, cylinders, joints, casting, lids, etc. Pressure:-Upto 60 Bar, Temperature- 150 C. To 175 C.
Full Sheets are also available upto 3 MM as per customers requirements. Owing to the expertise of our team in this arena, we provide for our patrons, Fiber Gaskets.